Founded in 2013, the Nature Nuts Kids Club is an active group of young naturalist who care about the environment. Club members manage and govern White Pine Tree Trail at the Douglas-Hart Nature Center. Nature Nuts management includes maintaining trails, picking up litter, removing invasive species, and planting new trees/flowers. A portion of each meeting will include planning for the next meeting, working outside in our area in addition to fun activities. Members will decide what projects need to be completed in what order, what tools we will need, etc. This is a great opportunity to be involved in a club that nurtures responsibility, conservation, and nature awareness. Members can work in their managed area outside of meeting times, and always work alongside Douglas-Hart Nature Center staff. Membership Dues: A one time $10 membership fee to help cover meeting snacks and supplies. There may be additional fees such as lunch outings or field trips but our goal is too keep fees minimal. Officers: We will now elect officers every year! Officers include: President, Vice President, Secretary and Treasurer. Acorn Awards: Acorns symbolize points for participants. Acorns are earned by completing tasks and projects with nature center staff. For example, members who attend a volunteer day, pick up litter, or are observed conducting a good deed will be awarded acorn points. Acorn awards and prizes will be awarded at the end of the year. How Do I Join? : Are you interested in joining the next group of earth loving, tree hugging young naturalists? Applications for the Nature Nuts Kids Club are being accepted, please fill out the electronic form below. Add picnic tables to the campfire area & expand campfire area to accommodate larger groups. 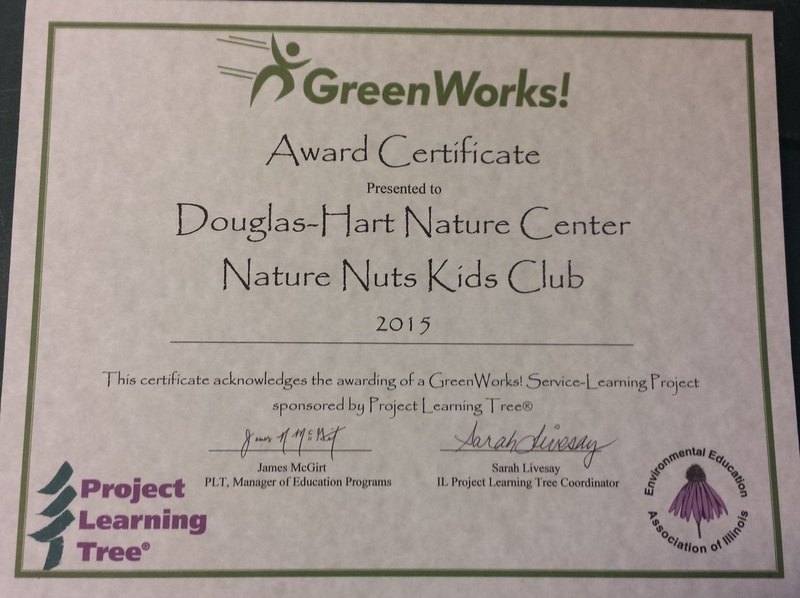 The Nature Nuts Kids Club was awarded $1000.00 grant from PLT GreenWorks in 2015. The funds were used towards new plantings, a new interpretive sign and Johnny Geocash! Visit Geocahing.com to find out where. Search "DHNC - Johnny GeoCash."